No. 2 Kentucky faces No. 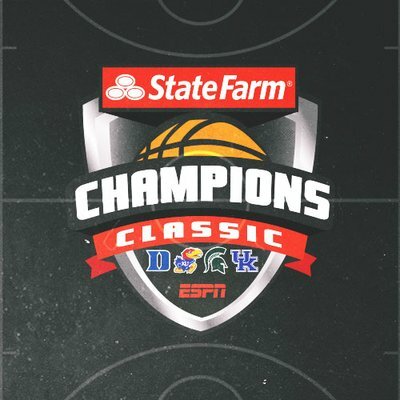 3 Duke in a major showdown in the State Farm Champions Classic in Indianapolis on Tuesday. The Wildcats have a deep incoming class, PLUS they landed Stanford transfer Reid Travis. The Blue Devils will showcase the nation’s top three recruits in R.J. Barrett, Zion Williamson and Cam Reddish. LINE: Kentucky is -2.5; O/U: 158. Travis brings 98 games of experience to a young roster. He is looking forward to a top-level opponent in his first game at Kentucky. Duke coach Mike Krzyzewski is still defining roles but will throw his freshman trio of stars into the fire and see how things play out. Duke was 29-8 in 2017-18. The college debut of Williamson has been an anticipated event since early in his high school career. Kentucky was one of the schools he shunned. The 6-foot-7, 285-pound Williamson has mixed well with fellow forwards Barrett and Reddish. Incoming freshman point guard Tre Jones has meshed in well also. The youngster has also impressing his older teammates. C Marques Bolden had a 3.9 average last season. He is the Blue Devils’ leading returning scorer. Kentucky was 26-11 in 2017-18. Reid Travis is back and averaged 19.5 points and 8.7 rebounds per game. Sophomore forward P.J. Washington averaged 10.8 points and 5.7 rebounds. They give the Wildcats a solid frontcourt duo that ranks among the best in the nation. Sophomore guard Quade Green averaged 9.3 ppg and was a part-time starter last season. Freshman Tyler Herro is expected to be a major 3-point threat as well. Kentucky may get some answers about some of the other newcomers during the game against the Blue Devils. Kentucky leads the series 12-9, but Duke has prevailed in seven of the past nine meetings.